Home Quick Tips How to increase Download Speed of μTorrent! µTorrent is a freeware closed source BitTorrent client by BitTorrent, Inc. Its a most popular Bittorrent client but very few peoples know how to set up μTorrent for maximum performance and be able to download faster. To facilitate this there are several tools that with just 1 click can accelerate μTorrent to download and upload faster. 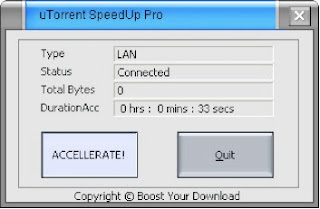 I am listing here four tools which will help you to imrove the download speed of uTorrent. uTorrent Acceleration Tool is a tool that is basically makes changes in the configuration of µTorrent to download torrents faster, this is done through an algorithm that, depending on the configuration of your Internet connection, the connection type and looking for some parameters optimizes the configuration. μTorrent EZ Booster is a tool that does exactly the same as Acceleration Tool. μTorrent SpeedUp PRO is the same as all these tools, their method of operation is the same but has the characteristic that is lighter and does not display the graphical statistics connection. μTorrent Ultra Accelerator is another clone of these programs to accelerate the download speed of μTorrent, but you can see in the screenshot does not include graphical statistics.